February is Love month. It is hard to escape it. Massive amounts of red and pink stuffed hearts, cards, candies and chocolates line the aisles of retail establishments. Local eateries are decorated with big red hearts, cardboard cutouts of an overweight, underdressed angel with an bow and arrow, and festive glittery red decorations. 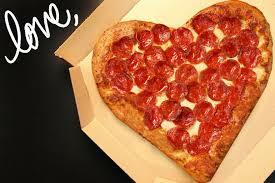 Did you know that in honour of Valentine’s day you can even order your pizza in the shape of a heart? Sure it’s fun but it can be so easy to get wrapped up in the sweet celebration of love for each other that we forget where all this love really came from. I love what we are told in 1 John 4:19 We love because He first loved us. It doesn’t matter what you’ve done, where you’ve been or even if you love Him back - Jesus love you!